If currently you only associate the Czech Republic with ice-cold Pilsner beer and tennis champions, prepare to add another worthy name of note to your mental reference list - Rojek, manufacturers of woodworking machinery. From a factory site in Kostelec and Orlici, 120 km east of Prague, the family firm of Rojek has been making table-saws, planers, spindles and the like since 1921. 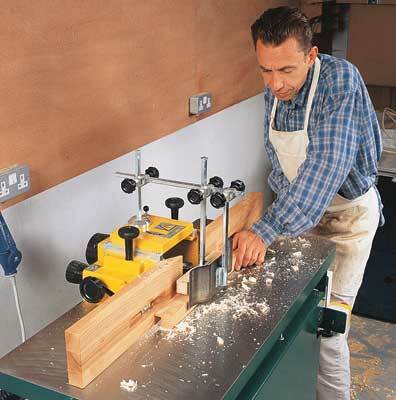 The FSN 300F is a weighty piece of kit - 170 kilos - and it helped me and my colleague Stuart work up a bit of a sweat as we struggled to get it up the step into the workshop. Fortunately Miles was passing by and, giving a fair impression of a county prop-forward, helped us heave it into the waiting gloom - only my head preventing a nasty collision with the doorjamb. I've never unpacked a brand-new machine before, and it was a fascinating task setting it all up. I especially liked the quasi-ritualistic degreasing of the bed - one of the final tasks undertaken before the first power-up. The model we tested was a single-phase unit which, for the average small-to-medium user, would be entirely adequate. My basic electrical wiring skills pulled us through and, after the safety checks, the spindle hummed into life, built up speed, then settled down into a powerful purr. 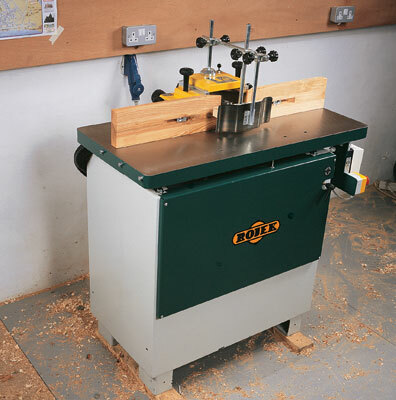 Smart in dark green, light grey and aluminium, the Rojek spindle moulder will enhance any shop it works in. It has neat, tidy lines with a footprint of approximately 800 x 500mm, although it is advisable to leave about 400mm at the rear of the machine to provide access to the motor and its gears. The top of the bed is just over 890mm from the floor; I wouldn't have thought that anyone would want to work at anything lower than this, and we can always make it go up. The cast-iron top is nice and thick and milled flat and true, albeit somewhat coarsely. There are three hex-headed bolts at each end for extension tables, and three threaded 10mm holes (a pair and a single) in the top itself, presumably for the fixing of accessories such as power-feeds etc. For all of you who enjoy rigging up your own guides and holding gear, these holes will provide suitable anchorage points. ?A further five pairs of threaded 7mm holes are positioned around the spindle centre for securing the guard and various fence assemblies. The four spacing rings (with one centre disk) are set bang flush with the top of the bed, and fit so snugly that it was a struggle to get them out at first. A quick bit of de-greasing with white spirit and wire wool and they were good to go. I must admit I did enjoy winding the spindle up for the first time and watching the centre disk rise like a top-hatted ghost from the tabletop. We all like a powerful motor and this one fits into this category - a hefty lump pushing out 2200 Watts in single-phase mode. If you go for the 3-phase, and this is something to consider for the averagely busy shop, power available increases to 3700 Watts, quite a step-up, and a very useful one to boot. 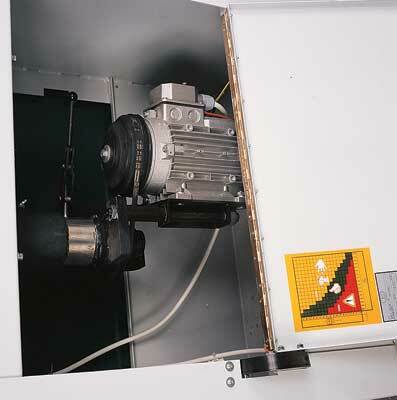 This waiting power drives the spindle via a standard V-belt through two sets of pulley gears, and results in a quiet (for a spindle) running machine. There are four gears on both the motor and the spindle itself, giving (by my reckoning) 24 different combinations, although only 17 are shown printed on a slightly confusing chart on the inner door. I suspect this is closer to realistically discernible speed settings; in actual use, though, I would only be using two or three combinations depending on my tooling set-up (size of block etc). Another important feature, and one that has come about through increased safety awareness, is the electronic motor brake. 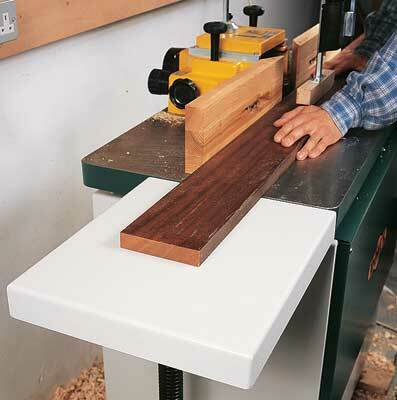 As soon as the power is turned off the brake kicks in and stops the spindle in seconds. Most impressive. The Rojek spindle comes with a decent set of spanners, wrenches, spacers, washers and shims - pretty much everything you'll need to set up this machine and use and maintain it. Once positioned carefully the cutter block can be tightened down securely using the 41mm spanner and the 10mm hex wrench provided. All the spacers are machined to a lovely close tolerance, have a decent weight to them and are topped off by the spindle-cap which features an integral locking pin that locates in the spindle itself for added security. The pressed-steel cabinet is braced and welded in 3mm sheet and would probably survive a fall from the back of a lorry relatively unscathed. Unless this is your preferred method of business I'd suggest making other arrangements. 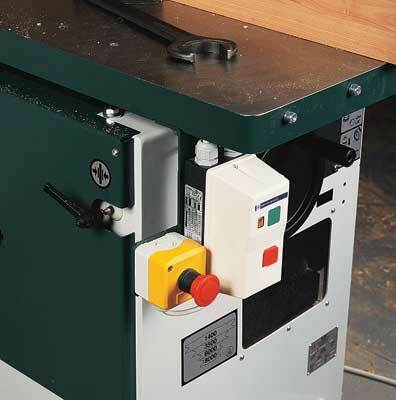 As well as the access door at the rear, this cabinet has a removable front panel through which the handle protrudes for the spindle lock rise and fall, positioned conveniently to permit two-handed working when setting the cutter height. The whole thing rests on four substantial box feet, and you can bolt it to the workshop floor or a custom pad (strongly recommended). The core of the fence and guard assembly is a solid stepped box, reassuringly made in cast-iron consisting of three heavy sides and a hinged plate top. 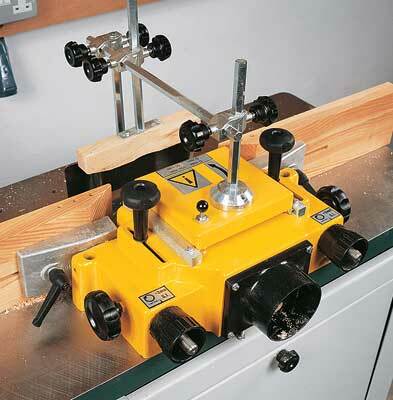 This yellow core is secured to the bed by two bolts with handgrips; for coarse front-to-back movement you slide the whole assembly within the confines of the two slots on each side. You can make finer adjustments to the fence by using the micrometer type hand screws, each of which is lockable. The fence itself, like most well designed ones, is in two independently adjustable parts and features actual timber bolted to the cast aluminium wings. These timber facings are substantial in 35mm laminated strip ash and measure about 420 x 120mm with a recessed retaining bolt and modified washer. All in all the fence set-up was greatly to my liking - it was simple and secure in operation, as accurate as you made it, and looked good too. I do prefer a fence to be faced with something that will take a pin or screw. If this were my machine I would probably face the ash with MDF or even make a complete new set with a heavy, inert man-made board and keep the ash ones for 'Sunday Best'. I don't know if the guards and holdfasts that came with this model are the customary set supplied by Rojek, but if they are then frankly it's a bit of a shame. ?I think the Czech designers could do with having another look at them; I'm sure it's just a case of economy rather than ineptitude, but the end result is the same. The adjustable frame assembly is the standard combination of hexagonal bar and right-angle joints, all in a substantial 13mm section. This rigid skeleton is bolted to the top of the hinged plate section of the main box core and the whole rig swings out of the way when required, normally being secured by a combination of slots and locking pin. I think I may have been a little unfair earlier - it's really only the actual pressure components that are questionable, and the frame outlined previously was certainly up to the task. The vertical pressure provider (or should that be non-provider?) is the worst offender, being simply a sloping ash shoe. The horizontal holder is at least made from sprung-steel. I think it's clear that Rojek has supplied only the bare minimum here - perhaps they know that most machinists prefer their own custom-made holding setups. On/off switches are positioned at the logical corner, and comprise the usual flush green and proud red buttons, courtesy of the French electrical giant Telemecanique. An extra stop button - larger and more accessible - doubles as a stop-lock and must be released before the machine will run. I can't help comparing this with my old machine - how elegantly the same functions were provided by two buttons set ergonomically within a brass plate. Sigh. 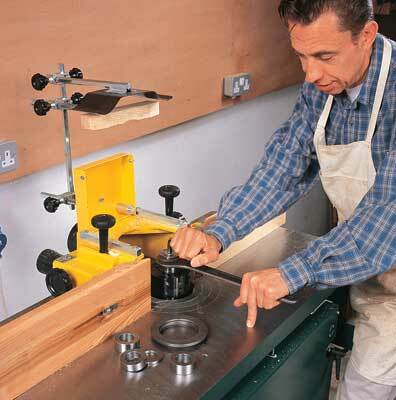 Right, your cutters are sharp and fitted to the block, the spindle is tightened down and the height adjusted to your normal high levels of precision. All that remains is to check the clearance on the fence. A quick spin of the block and... but what's this? Can't turn it? Well, Anthony and I were both surprised, and spent fruitless minutes looking for the rotation lock to release. It appears this is fitted as an extra, so make sure you ask for one or prepare for a bit more work. Waste extraction is from the back of the guard assembly box via a 100mm take-off vent, and also from a 40mm flexible pipe whose inlet is an integral part of the cast-iron top spindle bearing plate. Nice. This is one machine where extraction is not just useful, but an absolute necessity - something to consider when planning the purchase of a spindle moulder. I do like a good instruction manual and, despite the shocking absence of colour pictures and cartoon pop-ups, this one is worth covering and keeping for handy reference. They definitely employ a better class of interpreter at Rojek - something one or two Chinese companies could consider doing - and so there is little scope for amusement from unintentionally rude words or dodgy grammar. In summary then, I can happily recommend this machine, representing, as it does, good value and a pedigree that boasts of durability and longevity. With such a basic piece of engineering as this there is little to go wrong - always an attribute well worth having. The Rojek spindle is supplied in Britain by Jordan's in the North-East and, in the words of David Jordan is 'bomb-proof'. After using it for only a short while, I am inclined to believe him. Rojek sells a fair range of accessories, including power-feed, as well as dust extraction equipment and other kit of a more general nature. Happy (and safe) moulding to you all. "The Rojek spindle comes with a decent set of spanners, wrenches, spacers, washers and shims"
Budvar or a Rojek? No contest really, but have the beer after you have made your mouldings!